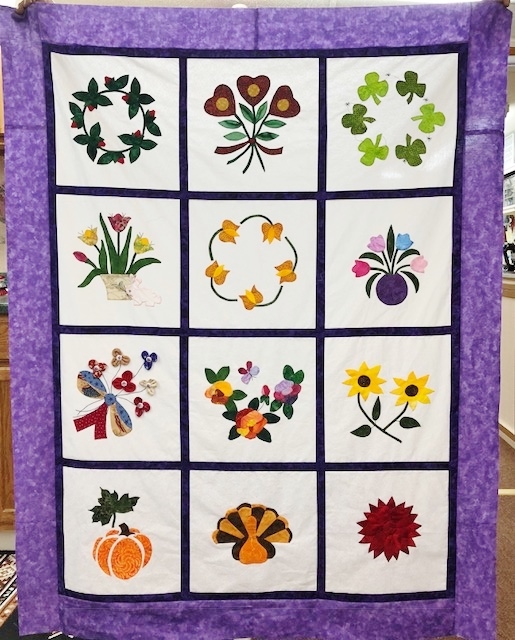 A Year of Flowers and Holidays Quilt! It is a Flimsy!!! Greetings again from South Texas where the weather is still nice! I had set some intense goals for March! I have now finished the 2007 BOM that was started in 2007 while wintering in Sierra Vista, Arizona. In my previous post I had posted a picture of the completion of the last 6 blocks! I do believe that I will take a break from applique for a few days and NOW load the Regatta quilt tomorrow. I had thought on Tuesday that I would just get the blocks sewn together and hang it until I could figure out a border! Well, the color purple spoke to me and here is the finished quilt top (or better known as a Flimsy!) What a relief to have this quilt top finished. I really never though I would complete it because it would require me to come up with 6 blocks that were not provided by the group that was doing a monthly BOM in 2007. I am now 2/3’s caught up with my UFO’s that were ready to be put together! Next quilt top will be the Texas Quilt! And TaDa – here is A Year of Flowers and Holidays! It was difficult to get a good picture and you can see the seams where I had to piece the outside border, but they will be covered up when quilted! Another one for my Z44 hand quilting frame. Clay is going to be painting the house this summer and I do believe that is when I will load quilts for hand quilting. In the meantime, I am going to take a little break and quilt some tops! I had selected 3 to do this month and will try to accomplish that goal! The sashings are a beautiful violet batik and the border is a Moda Marble that was absolutely made for it! I wanted to use a batik border, but did not have enough fabric but I will now though, as I re-ordered some from Web Fabrics. I have dealt with Carly since the early 2000’s when she started her business. Great place to purchase on-line fabrics. May God be with the families of those who lost their lives in Florida when the bridge collapsed at Florida International University, and with those who were injured. Have a blessed evening and I am going to relax and watch a movie and know I am slowly but surely catching up on my projects! This entry was posted in Quilting and tagged Web Fabrics. Bookmark the permalink. ← Hand Quilt Along for March and a Simple 2007 BOM is Finished! Thank you Carole. It feels so good to have it finished to this point. Not sure when it will be quilted. Someday. That border is just perfect with those flowers. It really makes the other colors sing! Happy dance for you, and a little long arming tomorrow, what a great way to end the week! What a beautiful quilt! You came up with some lovely designs. Enjoy the change of pace today. Thank you Gretchen. Such a relief! Yup. Quilting today! Congrats, Nanette! You’ve earned your happy dance this month! Slow? I think not! The purple border looks very pretty with your blocks. A very good choice. Thank you Karen. I am happy to be finished except the quilting. I love your purple border. Great choice. You have been busy there in Texas. We are getting better up here in WA. Keep up the good work. Love it,love it. Beautiful finish! Sure to be an heirloom! Congratulations! Thank you Mia! It shows it ‘quilting age’ as the BOMs were a little more simpler when I started quilting. It was a push, but so glad I finished it and yes I love the purple! Appreciate the comment Roseanne! Have a great week-end. I love it. The purple totally sets it off. Your applique work is awesome. You are welcome. It is so nice to share! Wow – that violet was the perfect color for a border on this. Congratulations on being so far through your assembly UFOs! By the way – your banner photo quilt is amazing. Thank you. That is a quilt that I designed and won a ribbon with! It is hand appliqued with embroidery around each piece.